1. Clonmacnois. Detailed View. Cross of the Scriptures. West Face. Panel W3. Clonmacnois monastic site, Co. Offaly. Each panel of the Cross of the Scriptures at Clonmacnois, Co. Offaly, is framed separately. The cross shaft and base have roll moulding at their edges, and each panel is separated by a projecting frame. It is noticeable that the arms of the cross tilt upwards. W3 Soldiers cast lots for Jesus' clothes. New Testament. Three figures are depicted in this panel, all three surround a central garment, T shaped. 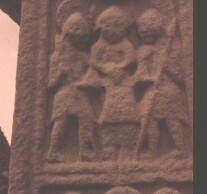 The central figure of the three (soldiers) appears to have a knife. The soldiers on either side of the central soldier are holding spears diagonally across their bodies. 75th Annual report of the Commissioners of Public Works in Ireland 1, , Dublin (1907) . Astle, Th., , ‘Observations on Stone Pillars, Crosses, and Crucifixes’. In Archaeologia (1807) 13, 208-222. Bigger, F. J., , ‘The Dextera Dei sculptured on the High Cross of Ireland’. In Proceedings of the Royal Irish Academy (1900) 22, 79-84. Brandt-Forster, B., Das Irische Hochkreuze, Ursprung - Entwicklung - Gestalt 1, , Stuttgart (1978) . Brown, G. B., The Arts in Early England VI, 2, Anglo-Saxon Sculpture (ed. E. H. L. Sexton) 1, , London (1937) . Crawford, H. S., , ‘Note on the High Cross of Clonmacnois’. In Journal of the Royal Society of Antiquaries of Ireland (1910) 40, 356. De Paor, L., , ‘Clonmacnois’. In The Archaeological Journal (1960) 117, 174-178. Doherty, Charles, , ‘Clonmacnois’. In Lexikon des Mittelalters (1983) 2166-69. Lexikon des Mittelalters 1, , Munchen (1983) . Edwards, Nancy, , ‘Some observations on the layout and construction of abstract ornament in Early Christian Irish Sculpture’. In Studies in Medieval Sculpture. Society of Antiquaries of London, Occasional Paper, ns (1983) 3, 3-17. Thompson, F.H., Studies in Medieval Sculpture. Society of Antiquaries of London, Occasional Paper, ns 3 1, , London (1983) . Gillespie, P., , ‘Note on the Sculptured Figure of a stag on a cross shaft at Clonmacnois, in relation to the Ancient wooden objects known as otter or beaver traps’. In Proceedings of the Society of Antiquaries of Scotland (1918/19) 53, 165-167. Guest, E. M., , ‘A Sheela-na-Gig at Clonmacnois’. In Journal of the Royal Society of Antiquaries of Ireland (1939) 69, 48. Harbison, Peter, , ‘The Antrim Cross in the Hunt Museum’. In North Munster Antiquarian Journal (1978) 20, 17-40. Harbison, Peter, , ‘Iconography on the Dysert and Kilfenora Crosses: A Romanesque Renaissance’. In The Other Clare (1981) 5, 16-19. Harbison, Peter, , ‘The Bronze Crucifixion Plaque said to be from St. John's (Rinnagan), near Athlone’. In Journal of Irish Archaeology (1984) 2, 1-18. Roth, E., Propylaen Kunstgeschichte, Supplementband IV 1, , Berlin (1979) . Henry, F., Early Christian Irish Art 1, , Dublin (1954) . Hicks, C., , ‘A Clonmacnois Workshop in stone’. In Journal of the Royal Society of Antiquaries of Ireland (1980) 110, 5-35. Ledwich, E., The Antiquities of Ireland 2, , Dublin (1804) . MacAlister, R. A. S., The Memorial Slabs of Clonmacnois, King's County. Extra Volume of the Royal Society of Antiquaries of Ireland for 1907-08 1, , Dublin (1909) . Morris, H., , ‘The Iconography of St. Patrick’. In Down and Connor Historical Society Journal (1936) 7, 1-29. Ó hÉochaidh, M., , ‘Cross Shaft’. In Rosc '67 (1967) 130. Ó Murchadha, D., , ‘Stone Sculpture in Pre-Norman Ireland’. In The Capuchin Annual 1969 (1969) 177-200. Ó Murchadha, D., , ‘Rubbings taken of the Inscriptions on the Cross of the Scripture, Clonmacnois’. In Journal of the Royal Society of Antiquaries of Ireland (1980) 110, 47-51. Petrie, G., , ‘The Ecclesiastical Architecture of Ireland, anterior to the Anglo-Norman Invasion; comprising an essay on the origin and uses of the Round Towers of Ireland’. In Transactions of the Royal Irish Academy (1854) 20, 1-521. Petrie, G., Christian Inscriptions in the Irish Language (ed. M. Stokes) 1, , Dublin (1872) . Porter, A. K., , ‘Notes on Irish Crosses’. In Konsthistoriska studier, tillagnade Johnny Roosval. Studier fran zornska Institutet for nordisk ocj Jamforande Konsthistoria vid Stockholms Hogskola VI (1929) 85-94. Roe, H. M., , ‘Illustrations of the Holy Trinity in Ireland, thirteenth to seventeenth centuries’. In Journal of the Royal Society of Antiquaries of Ireland (1979) 109, 101-150. Stevenson, R. B. K., , ‘Aspects of ambiguity in Crosses and Interlace’. In Ulster Journal of Archaeology (1981/82) 44-45, 1-27. Westropp, T. J., , ‘A Description of the Ancient Buildings and Crosses at Clonmacnois, King's County’. In Journal of the Royal Society of Antiquaries of Ireland (1907) 37, 277-306. Westropp, T. J., , ‘Clonmacnois’. In Journal of the Royal Society of Antiquaries of Ireland (1907) 37, 329-340.